So do what was commanded of you and relax and enjoy your family! If you want to add that something special for the day, then prepare ahead of time! How Do You Give Yourself Extra Time? Prepare dishes ahead of time- Prepare any dish that you can the night before. Find different dishes that can be prepared the night before. Then, about 30-40 minutes before the meal is to be served, slip those in the oven (If that's where they go) and voila, you have most of your morning to do what you want to do. Do Take Out- If your family is happy with ordering out there may still be restaurants open that day, but before deciding to do that, check around your area to see if any of them do offer that. Don't Prepare So Much Food-I know this seems silly because many people look forward to holidays because of the special food, but if you can find just a few dishes that everyone likes, do that instead. Potluck Style- You're already offering your house as a place to gather. Make the main meat dish and have guests or other family members prepare a side dish. As your kids get older, involve them in the cooking. Already Prepared Food- Not everything needs to be homemade. If you can throw some frozen vegetables in the microwave and you want to, do it! Buy that pie that's already made! Take Turns to Host-If you always host for holidays and you don't mind giving up the title to someone else, ask someone else to take over from time to time. If you feel guilty, bring a dish to pass. Use Fake Dishes-Did you know that you can buy fake china? I discovered some Premium Plastic Plates at Sam's Club a few years ago. They look like the real thing, but you don't have to wash them. Just recycle them. I know this can be wasteful, but it really does save you time and you don't have to worry about whether or not you have enough dishes or silverware to serve your guests. There's nothing more frustrating than figuring everything out at the last minute. Figure out your game plan! What will you do when it's time to eat? Do you have a place for the food to go? Make Room for Food- We have a dining room. We try to fit the main dishes in the middle of the table, but it doesn't fit all of it. We end up putting a card table to a side with less foot traffic and put desserts and side dishes on it. If there isn't enough room, put the dessert in the fridge or some other place that's safe from animals and people bumping into it. Move Things Around- If you are having guests, the house can get easily crowded. If you can, temporarily move your furniture around so that there is ease of moving around. Ask Someone to Set the Table-We use our dining room table for everything including socializing. It's difficult to play games or talk when you're doing it over empty dishes. I usually put out a nice tablecloth, maybe some pretty centerpieces, and then leave the rest of the table open. When I know the food is just about ready, I ask my kids to help set the table. Since we have family and friends, I really don't care too much about how it looks after because they still love me for me. 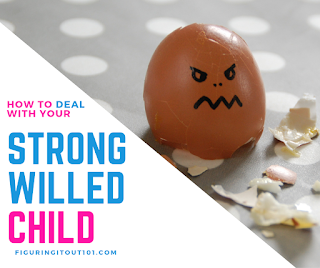 If you have a plan, you don't have to hurriedly scramble things together and keep your wits about you. What to Do With the Extra Time that You Get? Do what you love to do with your family. Easter Egg Hunt- I failed so hard at this, last year, but I think that Easter also fell on April Fools, so it kind of made up for it. If you do an Easter Egg Hunt, remember to fill plastic eggs and also make sure you count how many eggs you hid and remember where you hid them. I forgot to fill the eggs, so I told the kids that they were fooled and then emptied some candy bags over the table for them to divide and conquer... Don't be like me, prepare ahead of time. Play board games- My kids are just getting to the age where they can enjoy and understand some of my favorite board games. We're not quite ready to play Monopoly yet, but Battleship is pretty easy to play. Make Crafts- Construction paper is really one of my favorite things to use for crafts. You can make hand bunnies or decorate eggs. Watch Movies- It doesn't have to be an Easter movie, just find a movie that you, the kids, and the rest of the family enjoys and pop it in. Pop some popcorn and add some M&Ms for a special treat. Snuggle up with warm blankets. Apples to Apples- This is family friendly. There is a judge who either gives you a word or a description and everyone else who is playing either plays the word or description that they think fits that word best and the judge picks which one is best. Dungeons and Dragons- Make sure you set a timer for the turkey because this can take hours. Risk- Like Monopoly, this can cause your family to be estranged. What Do You Meme?- Give those Meme pictures a description- choose the best one. Exploding Kittens- This is like inappropriate version of Uno. Scrabble- This is a game that your kids can play if they aren't competitive. It teaches them how to read, spell, and learn new words for their vocabulary. Play at your own discretion. Remember, Easter is still a holy day. Have fun! If you made a big meat item, it's going to be done cooking between 3-5 hours. (perhaps more if it's very large). It's going to need some time to cool, so after you take it out of the oven, throw in your other side dishes that were prepared ahead of time. I know some recipes give different times and temps. What I usually do is find the middle ground and adjust the time accordingly. As long as you're not preparing other meat items, what we're mostly looking for is that the dish is warmed through. Have your kids set the table and then have everyone sit down and eat. Enjoy your Easter meal. Remember, this is the time to remember what Jesus did for you on the cross. Take time to relax and enjoy yourselves. Take it easy and enjoy the ones you love! Don't let the busyness of these holidays ruin your quality time and enjoyment of the day! This is awesome, love the tips. We usually host Easter dinner and yes it is so stressful to take care of 20+ invitees. Thanks a lot. 20+ invitees! Wow! You've got your hands full! I don't celebrate Easter. But, reading this makes me feel celebrate too. There are so many cute things to do. Another tip that I like to do is get my pre-made items from a local market. The food is made from scratch and fresh when I get it that way. Yes! Great idea! We love to get Walmart's pick three bucket. We'll fill it with wings and popcorn chicken. Many of their salads are good and it just saves time! My mom needs this. While, Easter is a very fun holiday it is so stressful in my jome. I think that we moms just forget to slow down. Holidays can be super stressful so thank you for the tips! These are helpful tips! We've never hosted an Easter party before but might soon. Will save these! What I do is pretty light, but I have cousins who host it for the whole extended family. The original family had 12 kids, so it would be all of them, their grandkids, and their kids. It's nuts! Any holiday can be stressful. It's so much more fun if we all slow down and just enjoy it. 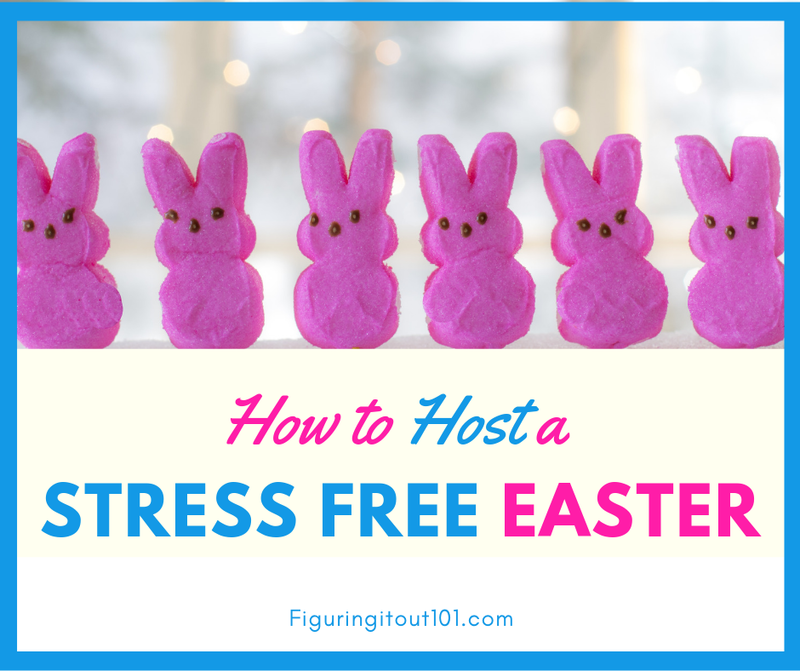 Such good advice, I am sure this will be helpful to many hosting this Easter - time to enjoy not stress! It's so easy to get caught up in planning, that we forget what's important. This post is so helpful! 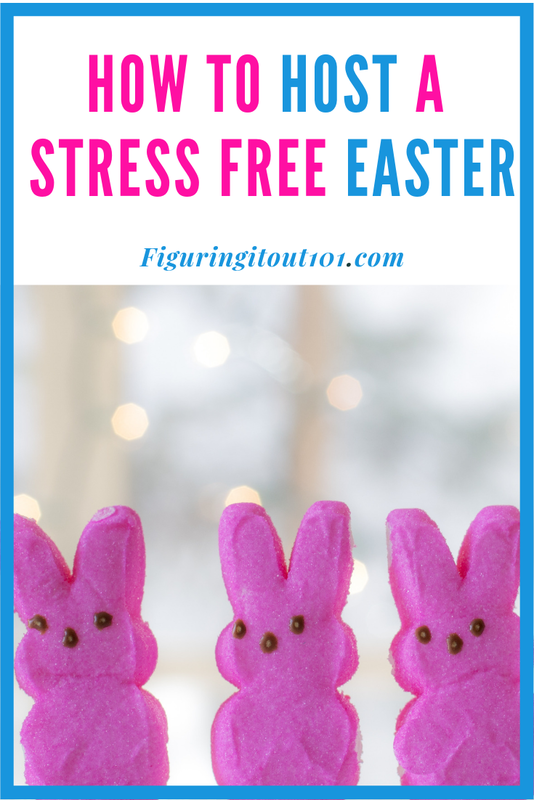 I'm actually hosting my first Easter event this year, so this post provides really useful tips to help make the day smooth sailing! Oh good luck and have fun! I wish I had enough people to do a potluck style easter. But with my mom as she is we really won't be able to have that kind of a thing. The games sound great though. Awww! I'm sorry to hear that. I don't know what's going on, but I hope that you're able to do something nice, still. 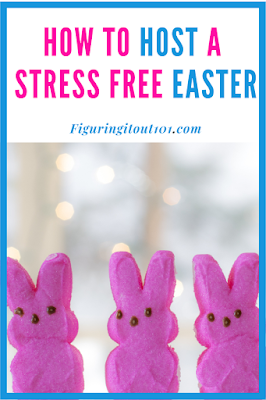 Looks like amazing tips to celebrate stress free easter.